(NewsUSA) - It happens during any given dental appointment; that embarassing moment when your hygenist asks how often you floss, and your reply (most likely) is, "Not often enough," at the same time he or she clucks disapprovingly and shakes his or her head. Turns out they know what they're talking about. According to the Centers for Disease Control and Prevention (CDC) nearly half of American adults aged 30 years and older (47.2 percent) suffer from some form of gum disease. Gum disease, also known as periodontal disease, is one of the main threats to dental health, but maintaining a healthy mouth goes beyond the benefits of a bright smile. Gum disease is a chronic, inflammatory condition, and recent studies suggest that gum disease and tooth decay may be associated with an increased risk of other inflammatory conditions, including heart attacks and strokes if left untreated. The CDC describes common warning signs of gum disease, including bad breath, gums that are red, swollen, bleeding, or tender; pain when chewing; loose or sensitive teeth; receding gums; change in bite; and change in the fit of partial dentures. Additional factors that increase the risk of gum disease include smoking, diabetes, stress, and poor oral hygiene. - Brush. Brush your teeth twice daily with a fluoride toothpaste. Pick a toothbrush style that fits your mouth and feels comfortable, and you will be more likely to use it. If your teeth are sensitive or you want them to be whiter, look around; there's a toothpaste for that. - Floss. Floss your teeth once a day. 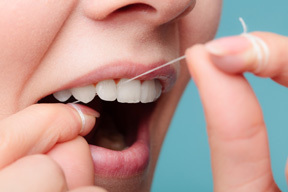 Dental floss is available in a variety of widths and thicknesses, although some people prefer disposable flossers, which are often easier for children to use. - Rinse. Oral rinses play an important role in a dental health routine. Gum disease is caused by bacteria, but an oral rinse formulated with bacteria-targeting ingredients can help keep gum disease at bay. Healthy Gums Oral Rinse from TheraBreath contains cetylpyridinium chloride, an ingredient approved by the FDA and clinically proven to kill the germs linked to gum disease. "Gum disease is more serious than people think. It starts out with just bleeding and sensitive gums, but in its advanced stages, it can cause tooth loss," says Dr. Harold Katz, founder and chief researcher for TheraBreath. For more information about keeping your mouth healthy and reducing your risk of gum disease, go to therabreathhealthygums.com. Healthy Gums Oral Rinse fromTheraBreath is available at Walmart.